There are 5 Assisted Living Facilities in the Franklin area, with 2 in Franklin and 3 nearby. To help you with your search, browse the 52 reviews below for assisted living facilities in Franklin. On average, consumers rate assisted living in Franklin 4.0 out of 5 stars. Better rated regions include Shelbyville with an average rating of 4.7 out of 5 stars. Located about a 20-minute drive from Indianapolis, Franklin, Indiana, is a small city with quite a substantial senior community. Approximately, 27.8 percent of the people in Franklin are age 55 or older, and the area has seven assisted living facilities to meet their needs. These facilities are classified into two categories: assisted living facilities and residential care facilities. Both offer assistive services, such as help with dressing, cleaning, and bathing, but residential care facilities also offer basic nursing services and assistance with medication administration. 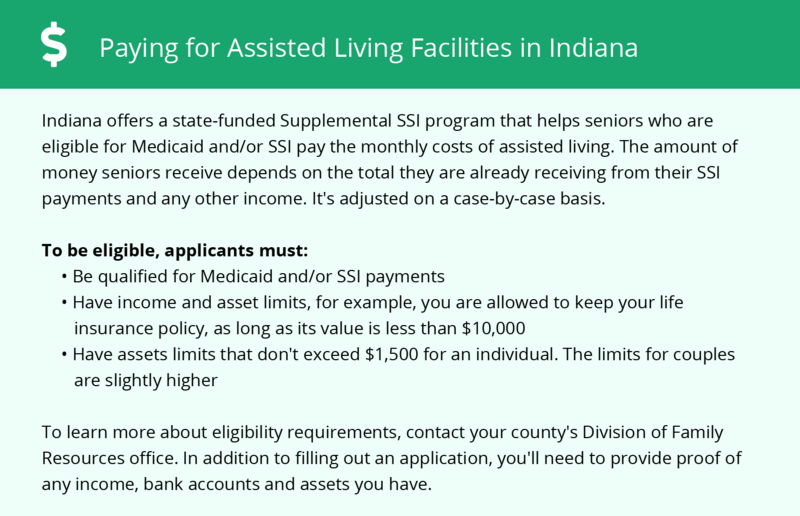 The Indiana State Board of Health Facility Administrators regulates residential care facilities but assisted living communities are only required to file a disclosure form with the Family and Social Services Division of Aging. Access Johnson County offers a fixed route bus service that connects to IndyGo’s routes, as well as the Veteran Transportation Services, transports veterans to and from Roudebush VA Hospital for free. IndyGo has a half-rate fare for seniors 65 and older. Also, Johnson County Senior Services offers transportation to seniors on a donation-only basis, making it easy to run errands on a low or fixed income. Franklin’s cost of living is on par with Indiana’s state average, but it's 11 percent lower than the national average. Because of this, seniors shouldn’t have a problem finding affordable options for things like groceries and health care. 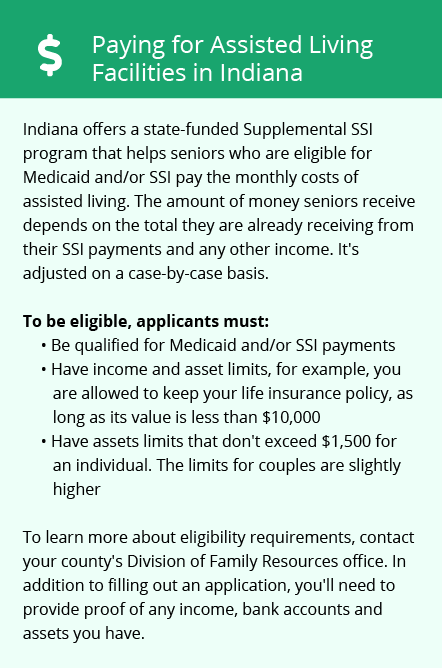 Indiana seniors can enjoy their Social Security income tax-free. However, withdrawals from retirement accounts and pension income are taxed at a rate of 3.23 percent. The Franklin area is home to world-class medical facilities, including Johnson Memorial Hospital, in the event of medical emergencies or illness. Franklin’s crime rate is higher than 96 percent of the cities and towns in Indiana. Also, when compared to communities of similar sizes, the crime rate in Franklin, for both violent and property crime, is quite a bit higher than average. This could be a problem for seniors who are concerned about their safety when venturing away from their assisted living community. The Franklin Active Adult Center hosts a variety of activities for seniors including crafts, BINGO, line dancing, exercise classes, and movie nights. They also take seniors on day trips throughout the year. Assisted Living costs in Franklin start around $0 per month on average, while the nationwide average cost of assisted living is $4,000 per month, according to the latest figures from Genworth’s Cost of Care Survey. Seniors can get assistance paying for the costs of assisted living through Indiana’s Regional Care Assistance Program (RCAP). The state also offers a Medicaid Waiver program that provides financial assistance to seniors residing in residential care facilities. To see a list of free assisted living resources in Franklin, please visit our Assisted Living in Indiana page. Franklin-area assisted living communities must adhere to the comprehensive set of state laws and regulations that all assisted living communities in Indiana are required to follow. Visit our Assisted Living in Indiana page for more information about these laws.